1. Melt 1 tblsp butter in a pan over medium flame. 2. Saute the onions in the butter till the raw smell disappears. 3. Grate the sweet corns over a medium vessel. 4. Add milk and enough water to cover it. 5. Add the ginger piece and fried onions. 6. Pressure cook till the corn is cooked or for 12 to 15 minutes. 7. Remove and allow it to cool. 8. Then remove the ginger piece and blend the rest to a smooth paste. 10. Heat 1 tblsp butter in a pan over medium flame. 11. Fry the carrots, beans, capsicum, peas and cabbage with a pinch of ajinomoto. 12. Add the vegetables to the soup and transfer to a pan. 10. Add salt, ajinomoto and bring to a boil, stirring from time to time. 11. Add the corn kernels and mix well. 12. Just before serving, add soya sauce and pepper powder. 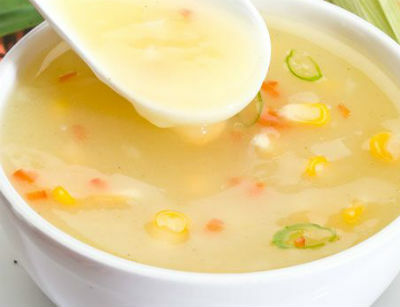 Feel free to comment or share your thoughts on this Sweet Corn Vegetable Soup Recipe from Awesome Cuisine.